When I first started using the async module, it felt like a dream come true. The waterfall() function became my new best friend. But, as the codebase grew and others started contributing, the code started becoming more and more tangled. Pretty soon I had async.series() and async.parallel() calls inside calls to waterfall() and the code was even more unmaintainable than before I started using async. 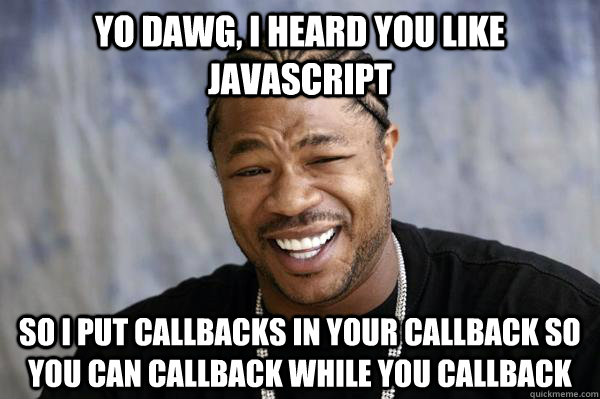 But at least I didn't have callback hell, right? Not exactly. My problem was not that I had nested callbacks, my problem was that my functions were doing too much. Async helped me sweep this problem under the rug for a time, but the poor code organization ended up coming back to bite me. Too often async and promises are used as a panacea to save codebases from bloated code and bad software design. People are always confused when I say I love NodeJS in spite of the fact that I agree (at least in spirit, if not the exact number) with Linus Torvalds' quip "if you need more than 3 levels of indentation, you're screwed anyway, and should fix your program." 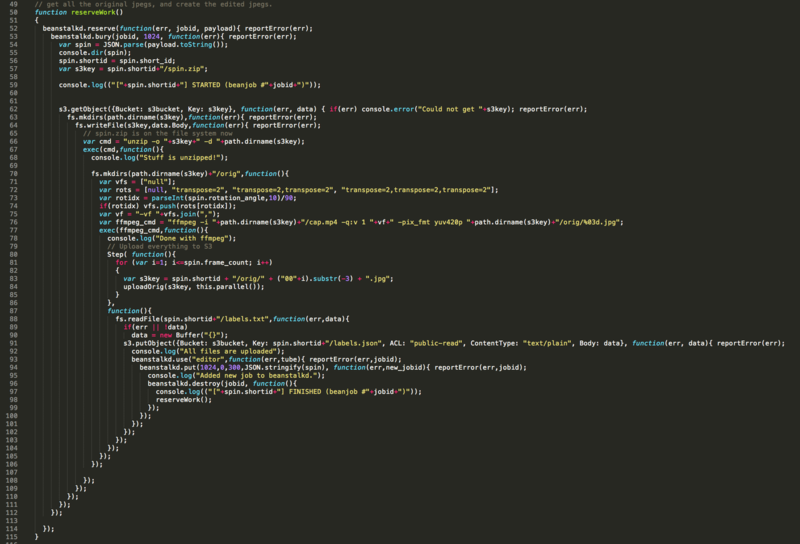 Part of the reason why I loved NodeJS from the beginning was that callbacks are just enough of a pain to write. Much like how the pain of your hands burning means you mistakenly picked up a hot pot in the kitchen, or a headache in the morning means you drank too much last night, the pain of dealing with 10 layers of nested callbacks in a single function means you desperately need to refactor. The small friction introduced by writing a callback is just enough to make you think twice about "is this extra I/O really necessary, or can I design this in a better way?"" I still prefer to use a framework like async or promises to make code more readable. But, if you're counting on promises or async.waterfall() to save you from banana code, the problem is probably more with your software design than with your asynchronous programming framework. Let's take a look at a couple "pyramid of doom" examples I pulled down from Google images. Here's a typical callback hell example borrowed from a post on medium.com. If you ignore this code's numerous other glaring issues, you'll see that callbacks aren't the problem here, the lack of sane abstractions is. Look carefully: does chair really need to be saved after table is done saving? Furthermore, there are programming constructs that enable you to not have to list out every Item explicitly; they're called for loops. If you're using mongoose, you would just use the create() function. Even without mongoose, async.parallel(), or promise.all(), you can write a simple function to make this much cleaner. An alternative solution using simple recursion makes for a more concise solution (12 SLOC, 4 branches) that maintains the behavior of the original code. Just another case where young developers should practice algorithms more and spend less time building iPhone apps. Another example I pulled down that's a bit less trivial comes from this presentation on wrangling callback hell with async. Click on the image to zoom in a little more, if you dare. 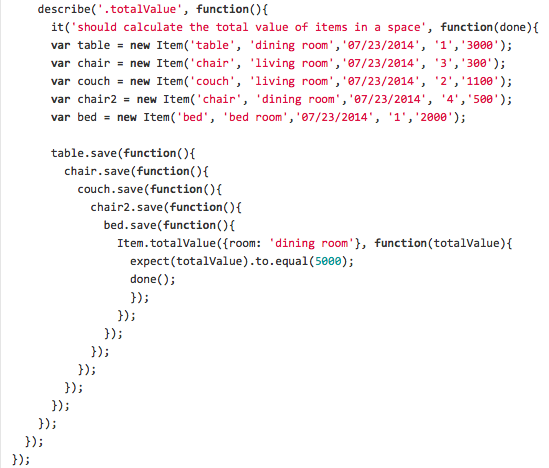 The function does way too much and has way too many points of failure. Furthermore, it skips error checks for many of these. Promises and async have mechanisms to help you check for errors in a more concise way, but odds are, if you're the type of person who ignores errors in callbacks, you'll also ignore them even if you're using promise.catch() or async.waterfall(). Callback hell is the least of this function's problems. Even if you wrote it in Python or Ruby, this function is a nightmare to test and debug. How would you improve this function to make it more durable and easier to test, debug, and understand? First you'd start by abstracting out the code that manages beanstalkd - the code that inserts tasks into a job queue has no business being in the same function as your business logic. Separation of concerns! The maximum indentation in the code as written is 30 (15x2). Creating a separate function that handles everything from L62-92 and making beanstalk call that function reduces maximum indentation to 20 (10x2). Adding an abstraction for "download this object in S3, unzip it, and put it into this directory, and create this directory if it doesn't exist" will reduce the maximum indentation to 14 (7x2). Since mkdirs creates directories recursively, you can simply save yourself the extra fs call and tell your S3 download code to create the /orig directory and bring it down to 12 (6x2). Finally, you can create a function that handles "read this file and upload it to S3" and reduce your maximum indentation to 10 (5x2). By breaking this function into a few helper functions behind sane abstractions, you've tamed the callback hell. In other words, this callback hell example is a strawman - there's no excuse for a professional software engineer to write production server code like this.